Improve the learning environment with modern school lighting that was designed specifically for classrooms, fully complies with standards and at the same time minimises power consumption and CO2 emission. Long lifetime luminaires guarantee low maintenance costs and light management system provides automatic control. At OMS we have created a solution having the wellbeing of the young generation in mind. The bright and uniform illumination of both horizontal and vertical surfaces in the classroom is the basis for optimal learning conditions. 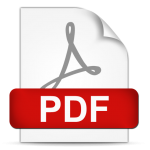 This facilitates the adaptation process of the eye between the task area and the environment. Ambient light aimed towards the ceiling helps in increasing alertness and improving performance as well. Our solution provides excellent light quality, while the suspended luminaires distribute the light efficiently without glare. Suspended LED luminaires provide great visual comfort for task areas. With both direct and indirect light distribution the solution enlarges and brightens the classroom space, thus eliminates the so-called cave effect. The result is an improved learning environment that has a positive effect on motivation and performance. The illuminance of surrounding areas and the ceiling ensures the adequate and uniform luminance distribution in the field of vision both for the teacher and the pupils. At the blackboard area, to provide maximum uniformity, luminaires specifically developed for lighting vertical surfaces are implemented along the board with an optimal light level of 500 lux. Push button enables the comfortable control of the board lighting. The LED solution combined with presence and daylight detectors increases the savings potential to the maximum. In the morning sensors dim the lighting to utilise daylight and save energy. During breaks when the classroom is empty lights switch off automatically which can lead up to 50% less consumption. Evenings need a boost of concentration with lack of daylight, so comfortable quality lighting is on. 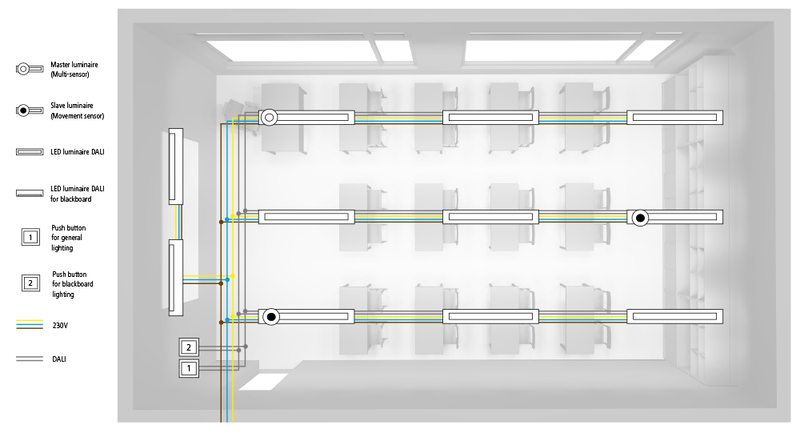 Suspended LED luminaires provide great visual comfort for task areas, with both direct and indirect light distribution that enlarges the space in the classroom. The blackboard area utilises assymmetric LED lighting for good vertical illumination. To maximise efficiency, sensors are implemented in the solution by including a master luminaire in each lighting line. Thanks to the built-in presence detectors the system automatically turns on when someone enters the room and, to eliminate unnecessary lighting hours, the system switches off automatically when there is no movement for a certain period of time. Light intensity sensor sets up the optimal light level, adjusting it in accordance with the available natural light. A fully automatic control system is implemented that ensures the 500 lux constant illumination level. The control unit manages a DALI-based plug-and-play control system. Push buttons enable turning the lights ON and OFF when needed. 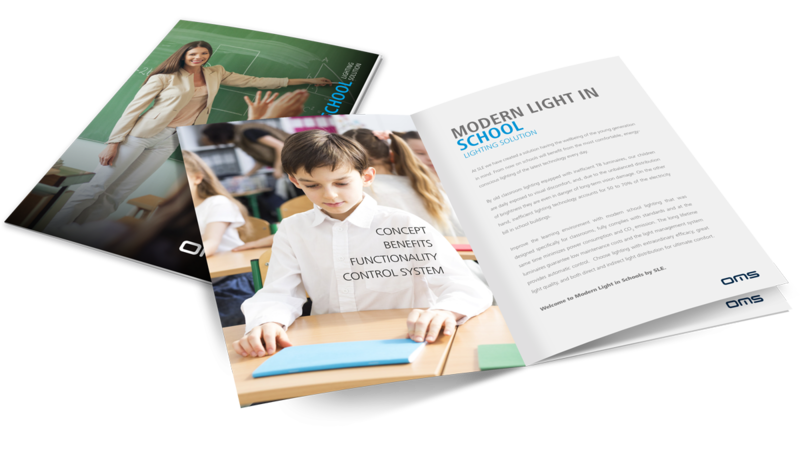 Download the brochure of Modern Light in Schools lighting solution by OMS to read about the concept, its benefits and how old vs. new classroom lighting affects our children.